Use the quality mind maps as a perfect addition to quality visualization in your quality management teams. Mind maps provide descriptive documents for daily work and keep all quality team members clearly informed about key points. With ConceptDraw MINDMAP and new Quality MindMap solution everyone can easily describe a quality process using a tree structure as well as show process relations, use visual symbols to improve understanding, and produce presentations. 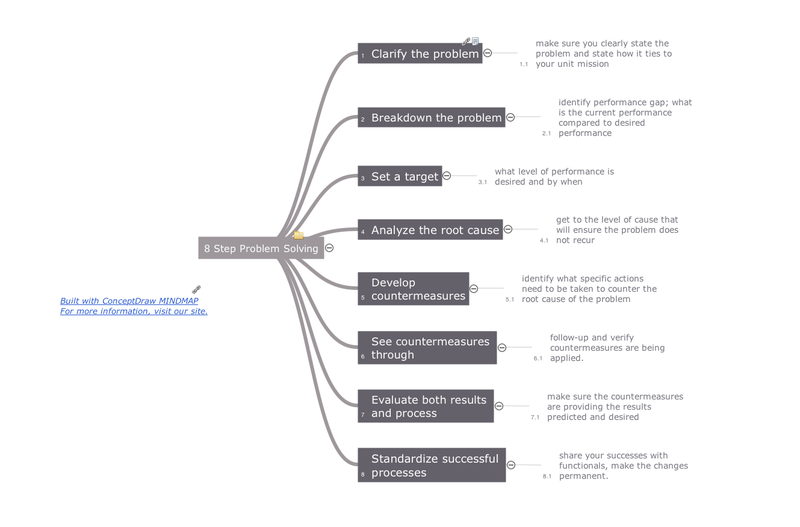 Pic.1 Quality mind map - 8 step problem solving. This mind map sample was created in ConceptDraw MINDMAP with Quality mindmaps solution as a demonstration of the creative approach to quality management in daily work of quality management team. Get a creative look at a quality procedures with mindmaping software ConceptDraw MINDMAP v10 Mind maps can be of great value in depicting and describing a problem in detail, then structure it, and find the right decision. Successful quality management implemented in a company of any size is a critical component of a company’s organization. You can use mind maps for a complete quality process analysis, giving more visibility to the focal points that you need to get clear. A software for group collaboration helps to facilitate action-oriented teams working together over geographic distances by providing tools that aid communication.